Tonight’s video features again all the 11 markets I follow. The market analyzed in the below videos are EUR/USD, S&P500, Dollar Index, Gold, USD/JPY, EUR/JPY, GBP/JPY, GBP/USD, AUD/USD, USD/CAD & NZD/USD. This video is related to tomorrow Thursday March 20th trading day. I hope this is useful to your trading and you enjoy it. I also want to thank all traders and students who are following my signals and analysis. You are awesome! Thanks for your positive feedbacks and emails. I wish you a great continuation of the trading and non trading week. Price of the S&P500 bounced off the all the way half way back from June lows and participation from program trading entered the equity index long in the 1630 area. This new long setup that is being respected has targets in the 1.740 area. Scenario 1. Price continues higher into the 1730 to 1740 area of target that would satisfy both the long setups in place (on the weekly and daily timeframes). This looks like the most probable scenario at the moment. Scenario 2. However, if price moves south to retest the 1630 area and breaks that level and the 1611 level, we could see price moving back again to the 1570 area. The probability of this scenario is small at the moment, but things could change at the next FOMC meeting. If you want to have access to trading plans, watch weekly video reviews as I develop or record them, or get information on setups (before they happen) for the Euro-Dollar cross, the S&P500 index and some high volume stocks, please subscribe my newsletter. 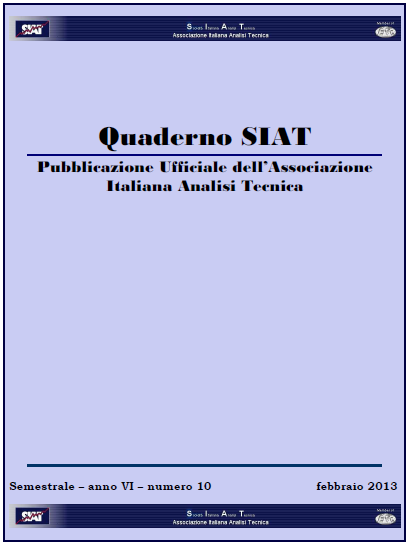 It’s free and you get additional content like market commentaries, setups, e-books, articles on HFT and program trading, learning material on my method and video-analysis that I don’t make available on my blog. If you intend using this information for your trading please do your own due diligence, find the advice of a trading professional and trade at your own responsibility. The information provided is for educational purpose only. Please read the Disclaimer and accept all the risks. Thank you. 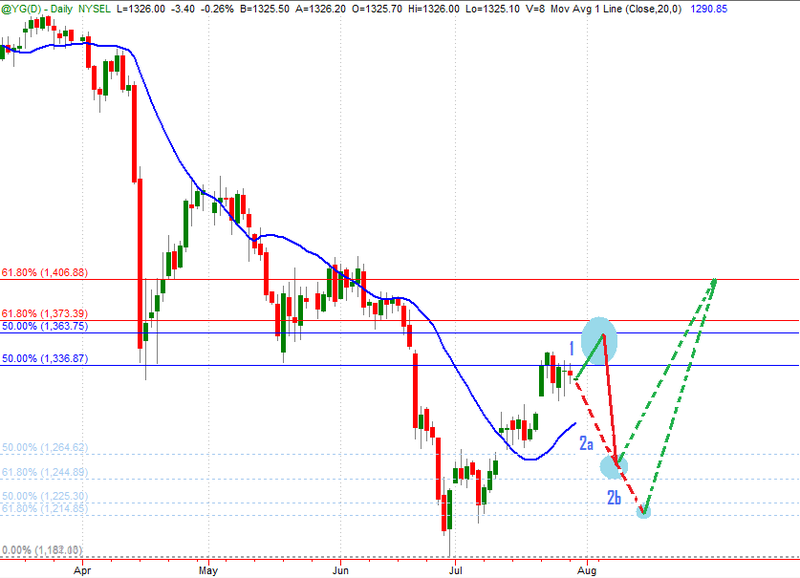 here is my analysis on GOLD. This is the first time I publish a review for this commodity futures. Hope you enjoy the review. Gold reached the 1,336 level where the resistance area extending to 1,364 starts. Our model of Program Trading activity on the daily timeframe shows that selling could resume in this area. In my opinion Gold will not be able to push above the 1,406 level. If we saw the lows of this cycle at the end of June (i.e. price is not going to print new lows), even if down move resumes it is my opinion that we could see a retrace into the 1,265 area. Below the 1,244 level it is possible for price to find a bid in the 1,225 area extending down to 1,214. The related scenarios 1, 2a and 2b are showed in the above picture. 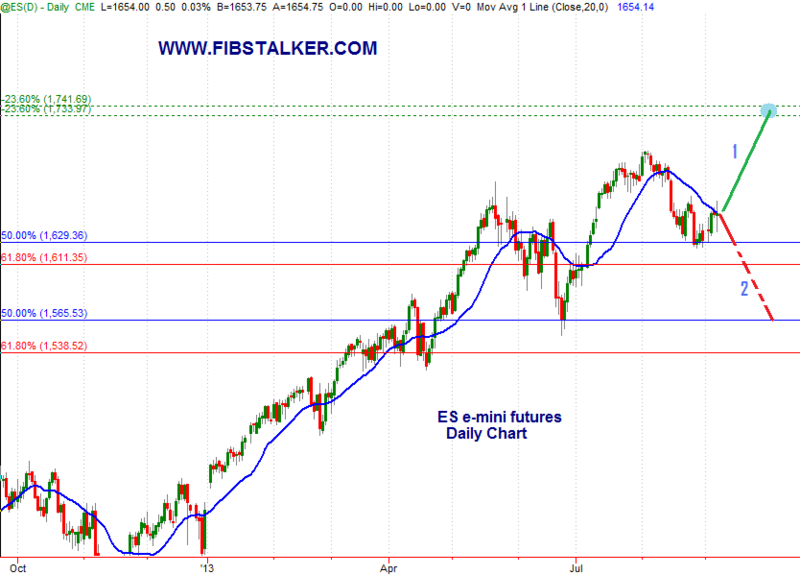 Here is a quick update on the Euro FX currency futures and the S&P500 emini. Please refer to the charts and analysis related to yesterday July 24th, 2013. Euro price followed scenario 2 (broken red line) identified and anticipated yesterday Wednesday July 24th. Our method, seeking to model Program Trading activity, suggests now a continuation into the 1.3310, first target area, and 1.3480 second target area, maybe during or at the end of the coming week. 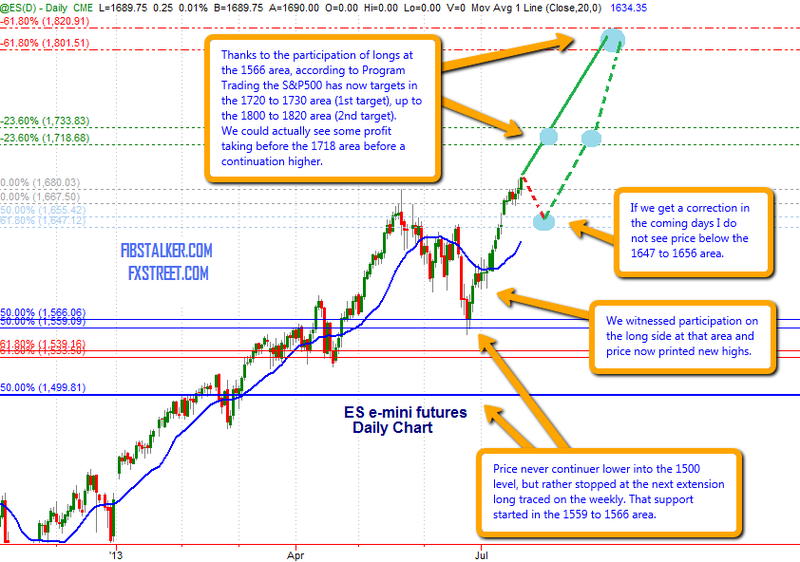 Price of S&P500 emini was picked by bulls before full retrace into 1,659. The first target in the 1,710 to 1,715 area is still active and our model suggests price could get there by the end of next week. 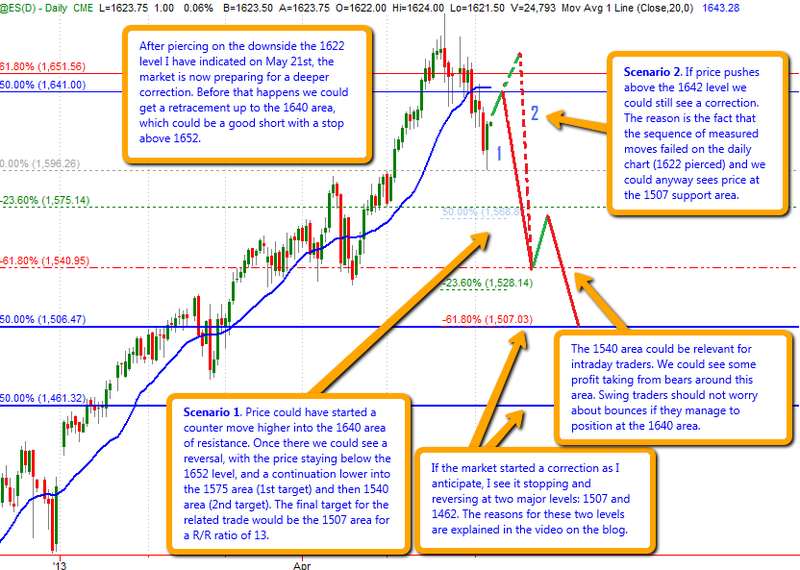 here is my analysis published yesterday July 24th 2013 on FXStreet.com. I am now official contribution to FXStreet.com, a leading website on Forex trading. 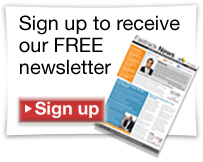 You will find my full analysis in my free Newsletter (subscribe here, it is free) and, some days, I will also publish in FXStreet.com. Hope you enjoy the review. After failing the sequence of measured moves higher in the second part of May on the daily timeframe, our model pointed to lower prices. S&P500 price, however, never continuer lower into the 1500 area as anticipated. Price rather stopped at the next area of support identified in our weekly model. That support is provided by the 1559 to 1533 area where we witnessed strong participation on the upside, showing that Program Trading is, in our model, still supporting prices higher. Price printed fresh highs on Monday and on Tuesday we saw a bit of profit taking. If we get a correction in the coming days our model does not see price moving below the 1659 to 1648 area. If price corrects into that area that could be a good opportunity for longs as our model of Program Trading is now targeting the 1710 to 1715 area (1st target), where we could see some sort of profit taking. Thanks to the participation of longs at the 1566 area, which we model as an entry of weekly continuation in extensions longs, there is also the potential for the market to get going and continuing into the 1800 area (2nd target), before a sensitive correction takes place. In that case 1800 would be a good place to take some longs off. After failing the sequence of measured moves higher in the second part of May price never continued lower into the 1500 area as anticipated. Price rather stopped at the next extension long on the weekly timeframe. That support area, in the 1559 to 1566,saw strong participation on the upside, showing that Program Trading is still supporting prices higher (see below picture). Price printed fresh new highs yesterday and today confirmed that move. If price gets a correction in the coming days I do not see price moving below the 1647 to 1656 area. If price moves into that area I see a good opportunity to buy or add to longs as Program Trading and professional traders are now targeting the 1718 to 1730 area (1st target). When/if price gets there I would expect some sort of profit taking. Thanks to the participation of longs at the 1566 area, which is an area of continuation in extensions longs, there is now the potential for the market to get to the 1800 to 1820 area (2nd target), before a sensitive correction takes place. In that case I would exit at 1800. On May 21st I published my latest longer-term view on the S&P500 e-mini. In that occasion I have clearly showed a support area (at the 1633 level) and a long failure price level, the 1622 threshold. Price first bounced off the 1633 level and then broke down piercing through the 1622, activating the Scenario 2b described on May 21st. After piercing on the downside the 1622 level I have indicated on May 21st, the market is now preparing for a deeper correction. Before that happens we could get a retrace up to the 1640 area, which could be a good short with a stop above 1652. If the market started a correction as I anticipate, I see it stopping and reversing at two major levels: 1507 and 1462. The reasons for these two levels are explained in the video on the blog. Scenario 1. Price could have started a counter move higher into the 1640 area of resistance (but it could also stop lower at the 1635 area). Once there we could see a reversal, with the price staying below the 1652 level, and a continuation lower into the 1575 area (1st target) and then 1540 area (2nd target). The final target for the related trade would be the 1507 area for a R/R ratio of 13. Scenario 2. If price pushes above the 1642 level we could still see a correction. The reason is the fact that the sequence of measured moves failed on the daily chart (1622 pierced) and we could anyway sees price at the 1507 support area. Notice that the 1540 area could be relevant for intraday traders. We could see some profit taking from bears around this area. Swing traders should not worry about bounces if they manage to position at the 1640 area.